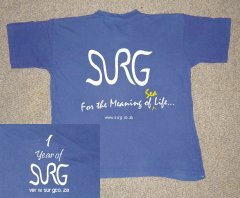 SURG's 1 year aniversary T-shirt! 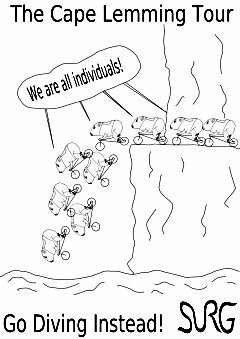 Celebrate SURG and its quest for the meaning of >sea< life. The image shows the back, the insert shows the front. Please send your order to the editor at SURG, and state the required size. T-shirts cost R75, incl. VAT, excluding postage. Only orders in South Africa can be accepted. The second SURG t-shirt design. Only for those with a sense of humour! The image is on the back of a light grey t-shirt, with the front sporting the SURG logo, as with our first t-shirt. Only 2 shirts are left, in XL size, at R70, incl. VAT. SURG's first design. Available in extremely limited numbers, for hard-core SURG fans only! This high quality cotton T-shirt comes in medium or large, at the introductory price of only R55, VAT inclusive, excluding delivery costs.